There are two ways of harnessing solar energy: Solar Thermal and Solar Photo Voltaic. Of these Solar Thermal technologies are the most efficient in converting energy from sun into useful energy. They are up to 85% efficient in converting solar energy. Solar Water heater is the best representative example of a Solar Thermal Technology. There can be significant savings, in the form of reduced electricity consumption from the grid, when solar water heaters are used. 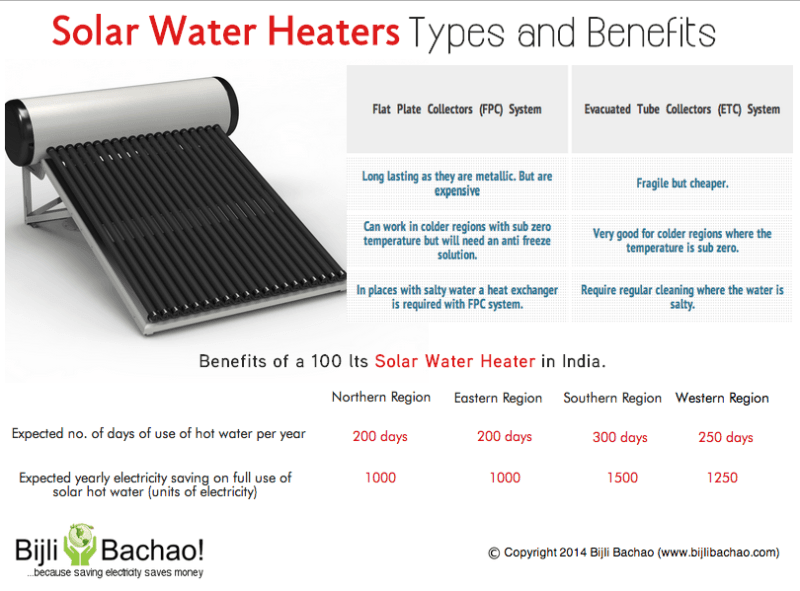 The infographic below shows the various types of solar water heaters available in India and how the use of a solar water heater can benefit people. More details available on our post: Solar Water Heater System – how it can help save on electricity bills.